at this corner in Berlin, where I sit down and have my cigarettes to think about matters of unimportance, people stop, look at their maps and mobiles not knowing where to go on. All exactly at the same spot. While I enjoy being lost, slowly I understand the meaning of this spot for me and everybody else who sees it. It might have been even the intention of the architect to create a watchtower with a sharp edge, which forces the unfamiliar walker to make a decision. It marks the coming edge of the district "Mitte". 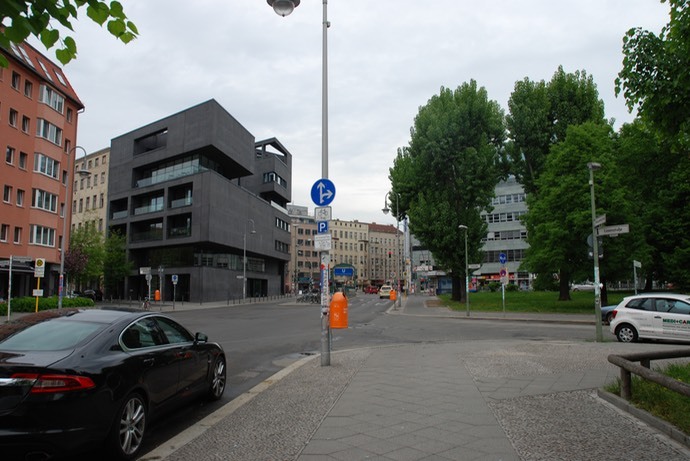 The "Torstraße" right behind is already a kind of natural borderline. Crossing that street would bring them slightly uphill the "Schönhauser Alle" into "Prenzlauer Berg", a district with a different atmosphere. The opennness of "Alexanderplatz" and the area of the "Volksbühne" closes here. One can not see how, where and where to it goes on. The sharp black edge is scary to cross, even if 100 meter further on one can see into the main roads again in all directions. While I am hanging out a couple of days here, sorting out my plans and administrative issues, I realize, that until here the project was all on safe ground. I knew I would come after Tallinn and Warsaw through Berlin again. From now on it will be possibly the journey with no return. The tour started already in Oberhausen, the fixed data of work made it necessary to take the same route forth and back. Since Berlin was my base for twenty years until a couples of years ago, I am well acquainted with it and the friends which are still here. "Lets see how far I get, it might end each kilometer, maybe tomorrow, maybe in three years. ", I tell my friends. They wish good luck and offer support for the unpredictable cases. I wish these cases dont come. Shure they will. Even if it stopps too early, not getting over to India, the bike breaks down or gets stolen, anything happening to me, however. At least I passed the black sharp edge of the watchtower. Tomorrow at 6.00 am I want to be on the road to avoid traffic, for lunch I might be in Oberhausen again, where I need to change a few elements of equipmnent, check the bike one more time, oils and brake-pad changes, synchronization, etc..
Another good-by to the family, then it goes definitely south and east. The last 100 meter to see open field is streched for me again to around 600 kilometer. Doable!